Too many snakes spoil the view. In retrospect, axes and stilettos are not particularly funny weapons. Maybe battle axes are funnier than forest axes, and I’m thinking stiletto heels are almost certainly funnier than stiletto knives. I’m still working out this visual humor thing. Maybe I need to watch Who Framed Roger Rabbit? again. But in fact, this comic is a bit of a bridge, so maybe it’s more important to showcase Dragon’s anger than Dragon’s comedic timing. Do I owe it to the reader to be funny all the time? My tradition puts the story in front of the tone. Maybe Friday’s story will lend itself to a better punchline. Definitely next Friday’s story will, in a cerebral way. But this arc is a little darker than usual. So be it. I’m not for everyone. If you don’t get it, you can always go read The Family Circus. Looking back over my notes, I see that I missed the marginal note explaining that, in panel 4, Dragon should be carrying a burlap sack, a coil of rope, and a roll of duct tape. I leave it to the reader to decide whether that would have made panel 4 funnier or bleaker. 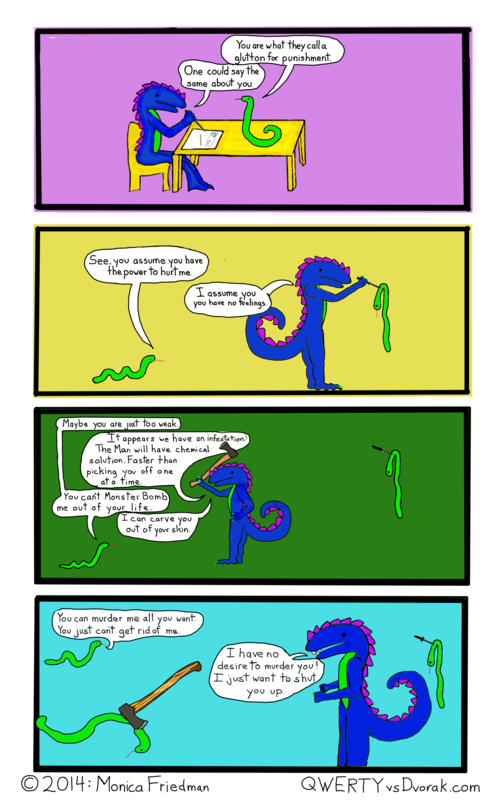 This entry was posted in Comics, Dragons and tagged axe, critics, dark, dragon, snake, stiletto knife, webcomic on November 12, 2014 by littledragonblue. So, you like that bt I lent you. How many little dead bodies did you find? Ug I don’t go looking for them!